With the great summer over and Jack Frost knocking on the door unseasonably early, the questions arises: what is Gus up to? Well it turns out he’s playing mid-stakes PLO on partypoker. He let us know what was going on in – spoiler alert – a video entitled “Bad Idea!”. The clip shows him four tabling $10/$25 Pot Limit Omaha games. As he himself mentions (“The most hideous idea of all”, he calls it) with his online record, he might have wanted to stick to crushing it live, rather than booting up his laptop. For those young enough not to have enjoyed a large scale online Hansen blow up, the graph below of his Full Tilt results ought to fill you in. 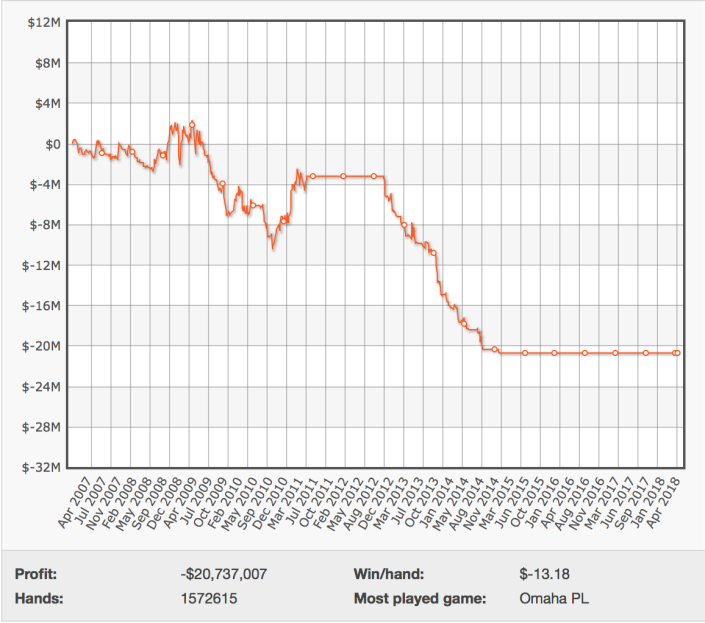 That’s is what it looked like to be a losing player during the softest period of poker in history. It is a reminder that a methodical players like Gus Hansen (who used to take notes on his opponents in live games by dictating in Danish into a dictaphone) are not always best served by the high-speed instant gratification of four-tabling it online from home where the drinks cabinet is within easy reach. That, and: every great summer has its end. When you lose all your money in online poker, you have to do the cleaning yourself!